Q. Many in the ANC think it will maintain a 60% majority, what would you say is the ANC’s strongest points coming into the elections after 25 years of being in power? I think the ANC is between 55%-60%. Now whether it does achieve it will depend on its election campaign. The ANC will need to regain the 2 million ANC voters who didn’t vote in last local government election, many of which are living in Soweto. So, ANC will have to do more campaigning in Soweto where voters have been sceptical about the ANC and politics in general. Over the past 25 years, the ANC has done a remarkable job. I will admit I am prejudice given my involvement in not only the ANC and the SACP. When it comes to the delivery of services, there has been greater availability of clean water, electricity, housing possibilities for our people and education opportunities such as universities. We have also improved healthcare in the past 25 years. However, it is not enough. We should understand that in 1994, when the ANC won the elections and assumed some elements of political power, very far from economic and other areas of power, we inherited a bankrupt country, with huge debt. This debt could not be unravelled since the Nationalist Party government mixed it with people’s pensions, and we could not dismiss this debt. Given these challenges, by all accounts, we have done well. Due to the complexities of the issues we faced, we still face a significant number of difficulties and Zuma’s reign has also done a lot in negatively impacting the work that needed to be done. The ANC needs to resolve these challenges, yet it is a deeply divided party, in which appointments were made according to loyalty and not competency. Even ministers were being appointed according to ethnic identity, which was foreign to the ANC and we were wholly opposed to it. So, yes, the ANC has done well but we still face substantial socio-economic problems that we need to confront because the reason for ANC’s existence is not to protect individuals but to promote the people’s interest. Q. Many critics of the ANC argue that the party is out of step with the people and its policies are out of step with the needs of the country, given that we are in the 4th industrial revolution. Do you think the ANC should do away with its 40% continuity policy and increase the youth representation in the national and provisional list from the current 20% in a bid to boost policy innovation? Those people have the wrong approach, yes renewal must happen, or an organisation will die —what you need is the right balance between restoration and continuity. You cannot have a whole lot of people who don’t know anything about parliament. Since 1994 we have gained experience about how parliament works. We cannot ignore that parliament remains a critical organ of state, as its oversight responsibility is key to democracy. You always need forces external who must be able to point out the executive’s weaknesses in deriving policies and implementing them. Moreover, renewal does not mean you put in all these 18-year old people into government. It is imperative to look at it from the view that if you are looking to the future, how do you develop young cadres’ understanding of the country, the region and world. The best places are the ANC and the tripartite alliance, in order to grow their experience. The challenge with just throwing people in, you could kill them by giving them responsibilities when they are too young. Yes, we led at a young age but today the opportunities are many for people who join the ANC such as gaining work experience in the private sector or other places, which will help young cadres become better MPs, MPLs and councillors. There are those who may be ready for it due to their history within the ANC on an organisational basis. However, we must try to bring together the multiplicity of talent. The mistake we made during the Zuma years was that this was lost. Due to people being brought in on a factional basis and loyalty rather than competence. This has led to a decline in the ANC and thus the ANC requires new blood, but it shouldn’t be brought in for the sake of it. We must also remember that the ANC constitution states that 50% of electable people on both the national and provincial lists must be women. That is an ANC decision. So clearly the list should indeed reflect this in the top 200 candidates for parliament. However, what we haven’t done in the ANC and what I regret is that we have not paid attention to people with disabilities. At least in my time, we systemically fought for people with disabilities to be on our list. Otherwise, how do we ensure representation of all people? Lastly, there is the issue of the national question about the national minority, which was missing from the list, which is a shame because the ANC is known and must always represent the totality of our population. So, you would have to balance that with the majority being black African, but you must bring in whites, coloured and Indians. Remember, coloured people are equal in size to white people. So, it is a huge voting population, but you won’t get it to vote for you until they see a significant representation on the list. So, we will have to see how the ANC list copes with the demand for what I call the national question. Q. Let’s look at the issue of corruption, especially as it pertains to the blurred lines between the state and private capital. Many have critiqued the business sector’s undue influence over the government, to the detriment of the government’s commitment to serving all its people. Given your involvement in government and the ANC? Would you agree and how should we deal with corruption? Let’s make it clear from the beginning. All forms and manifestations of corruption are bad. This is because they steal from the poor to enrich the already rich. The second thing is that once it takes hold, it means people who want to do things because they believe in something become side lined because of those who wish to enrich themselves. We must do everything we can to get rid of corruption esp. the intent and impact of fraud. We must remember that Apartheid which was defined as a crime against humanity by the UN, was the most corrupt society in the world. We inherited not only a bankrupt country but also government and public service. So, you take people into positions and you see that the money and power became too great for them to handle. Now who corrupt? It is the private sector because it has the money and capacity to corrupt. It was thus not hard for companies to bribe the government and SOEs since 1994 in order to undermine good governance. They (private capital) wanted to demonstrate that black people are not capable of governing and that they are corrupt. Now the Zondo commission is bringing out a lot of details about how widespread corruption was in government and SOEs. The question is are our law enforcement agencies ready to charge people? We have yet to see any charges being laid against those implicated in the Bosasa, Transnet and Eskom scandals. Even Zuma is yet to be charged even though he faces charges on another matter. Do our law enforcement have the skills and if not, how do we bring external skills? We need to move with exceptional speed to charge people. Either they spend time in prison, or the state must take away assets gotten through ill-mannered means. Q. Turning to the African continent, many would argue that under Jacob Zuma South Africa’s leadership in the continent has been in regression. Do you think President Cyril Ramaphosa could change this trajectory? What is CR’s foreign policy doctrine, if Thabo Mbeki’s was African renaissance and African solidarity? Well, let me start by saying you are not a leader by proclamation but if you don’t do the things that a leader does, you are just fooling yourself. It is not for South Africa to decide that we want to be a leader on the continent but the work we do and the positions we take determine that. Even right now with our temporary seat on in the UN Security Council. Under Mbeki, we developed fresh policies. Firstly, we moved from OAU to AU. Yes, through Nepad we established how we wanted to project ourselves in the international community, how do we protect, promote and defend the interests of our country and continent. In a world where dominant countries want to exploit the continent for profit reasons and the resources of the continent. 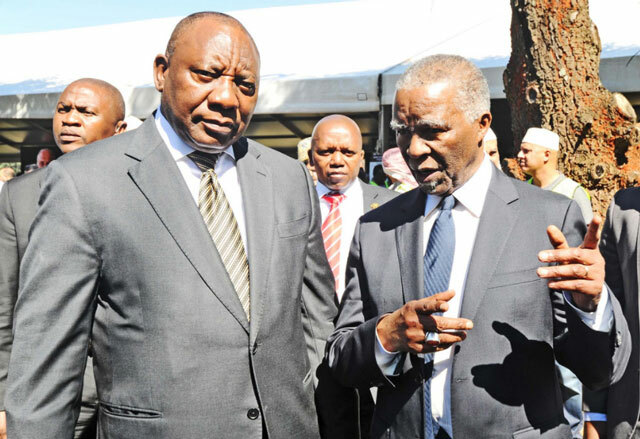 So, Mbeki was very well-known through the kind of positions we undertook such as NEPAD and the African Peer Review Mechanism, which were improved by the other countries. South Africa needs to be very careful, yes, we are the dominant player in the region, given the size of our economy relative to our neighbours, the amount of electricity we sell in the region, our stock exchange and developed financial institutions but we should not work with our region in order only to serve our needs. Mbeki and I agreed that we ought to be region’s interests first. We would benefit through their growth and development by being able to supply goods and services to these countries. Therefore, Ramaphosa must convince our people and the region that we will work towards promoting the interests of the region. We need to also demonstrate this commitment by looking at how we open our borders, to ensure greater movement of labour in the region. Now, you try to stop people from moving here. The challenge when you do that is that they come in illegally and as result they cannot receive critical services as South Africans can. Now, we have taken decisions as SADC, but implementation has been slow due to in part these smaller countries being afraid of South Africa’s dominance, but you cannot stop economic expansion on the region! Let me add this, I don’t believe that South Africans are xenophobic, but some elements exploit this idea. Look at the entrepreneurship skill that has been developed by other people countries but not our people in the townships who were not allowed to develop. We need to build collaborations between our people and foreigners in order to share skills and develop the economy.